Raaga.com: Wanna guess what Kangana Ranaut shares in common with Amitabh Bachchan and Shatrughan Sinha? Wanna guess what Kangana Ranaut shares in common with Amitabh Bachchan and Shatrughan Sinha? 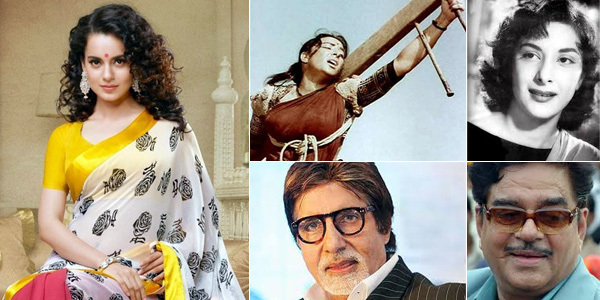 Wanna guess what is common between rising star Kangana Ranaut and the top notch Bollywood veteran stars Amitabh Bachchan and Shatrughan Sinha? Well besides possessing their kind of versatility and histrionics Kangana Ranaut has one more thing common which she recently revealed in an interview. Speaking to a leading national daily Kangana expressed how the media had distorted her name; a common concern shared by the legendary actors Amitabh Bachchan and Shatrughan Sinha, when they made their debut in Bollywood? She added, “When I did tried to correct the surname, then the media started referring me as 'Raut', this irritated my grandfather and he called me and blasted, "You have gone there and ruined our name." Similarly when Amiatbh Bachchan and Shatrughan Sinha made their debut in Bollywood their names were radical names and unheard. Hence both Bachchan and Sinha had to face the burn. Shatrughan Sinha, who’s real was Shatrughan Prasad Sinha, was advised to change his name. He changed to S.P. Sinha and worked in few films but the name sounded like a police officer hence he reverted back to Shatrughan Sinha, (dropping Prasad) but as predicted his name proved a hurdle in his career. Being a tongue twister his name was distorted as some called him Shatyganj, Shatrudhan, Shatrubin etc. Finally popular film magazine Stardust coined him a new name ‘Shot Gun’ till date he is popular with this tag name!